My family and I took a vacation to Michigan to visit family this past week. 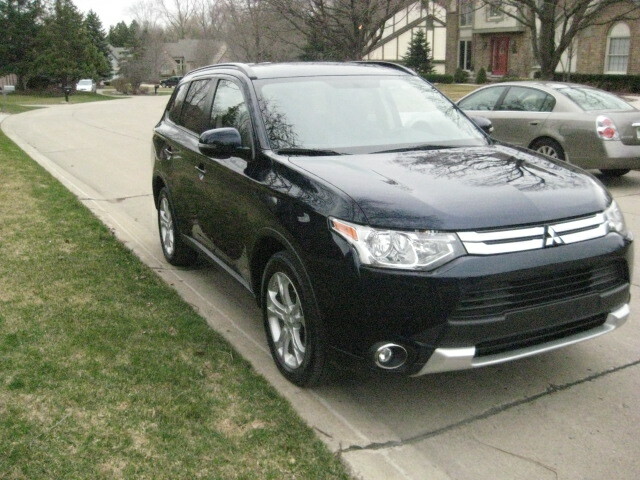 I was lucky enough to hook up with DriveSTI via the 411 Mommas while there and get to test out the 2015 Mitsubishi Outlander for the week. 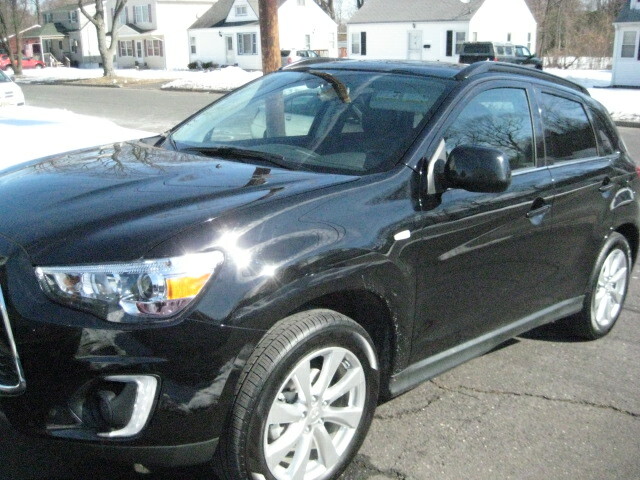 Last time I reviewed the 2015 Outlander Sport, so I was excited to try the standard edition because it had 3rd row seating. The 3rd row seating was probably my favorite feature of this vehicle for this trip. It enabled all of us to travel together in one car rather then taking multiple and following each other. And we sure traveled & shopped a lot! While I had the vehicle, we visited the Ann Arbor Hands on Museum which was really cool! I have a giveaway going on for 4 passes to this museum if you’re local to Michigan or plan to visit before the year is up (they expire Dec 2015).. Just check out the post below this one. We also went shopping at the 12 Oaks Mall and made some pit stops along the way. I don’t know what it is, but I love going to malls in other states. There’s something just a little bit different seeing the state pride attire at each. We took a family 6-person trip to Target and boy did we shop. We left with over 6 bags of stuff filled with toys, clothes, and groceries and guess what? Yep, we were able to fit it ALL in the trunk with one of the 3rd row seats pushed down as well as a stroller AND my sister in-law in the far back seat. It made it easy that she was able to hop out of the back of the trunk being that I had a car seat and booster seat and myself in the middle row. I didn’t have to worry about folding the seat down to let her out. The push to start was another plus, but you already know I fell in love with that feature from my last review for DriveSTI. When you’re a big shopped like me, it’s easy to open the car or trunk with a quick tap instead of fiddling with your keys or in my case, trying to find them in your purse while holding bags and a 2 year old. This standard model (I had the Cosmic Blue color if you’re wondering) didn’t come with a GPS built it. I thought that was odd being that it is 2015 and all vehicles should come equipped standard with GPS, but I guess it’s still an “upgrade”. It did still feature a 6.1″ touch screen panel to maneuver the audio features and also had the controls built into the steering wheel which I loved. 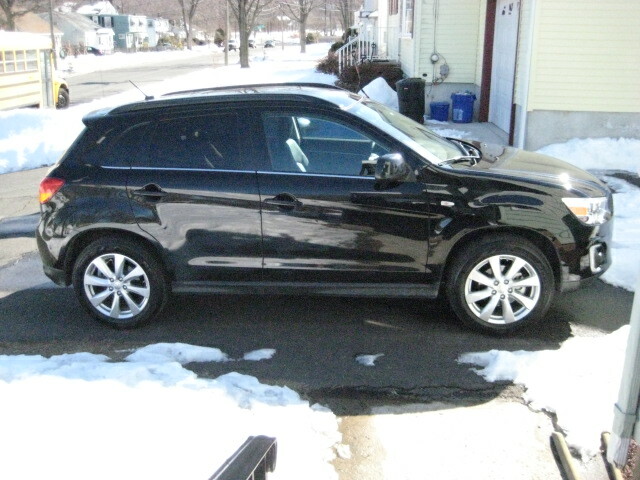 The gas mileage on this was amazing for how big it was, 26 MPG combined, but it’s a 4 cylinder, so the pick up when you press the gas shows it.To me though, gas mileage is a big deal and I rather have the car move just a bit slower then fill it up everyday. All in all, we enjoyed having this addition to our vacation and it allowed us more time with our family instead of driving to our destinations in different vehicles. I received this vehicle for review purposes but all views and opinions are 100% my own. I was so grateful to have the opportunity to be a guest on the 411 Mommas (www.the411mommas.com) and get to review this amazing vehicle! 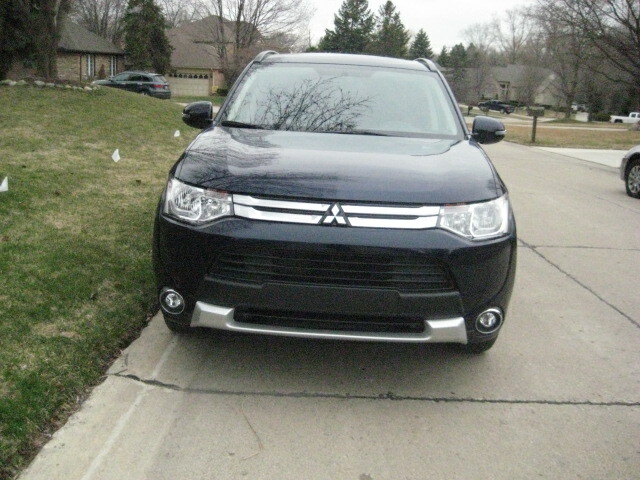 Check out my in depth review of the car I had for a week, 2015 Mitsubishi Outlander Sport on the411mommas.com! I absolutely loved being a #guest411momma. Head over check out their youtube channel as well for some amazing tips and fun videos! Overall, we really loved having this SUV as part of our family for the week! 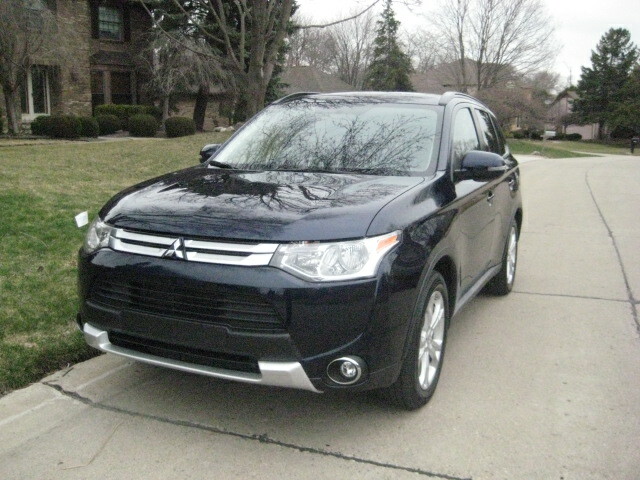 This 2015 Mitsubishi Outlander Sport gets 27 MPG Combined – 24 MPG city/30 MPG highway. I had it for a week and drove about 300 miles city/highway and still had a half tank of gas! I was very pleased with how it balanced out when you drive on highway vs city and there is an”ECO” indicator that I am not sure what it meant, but it did flash from time to time. I assume it’s saying I am driving ECO friendly? LOL! There is a large panoramic moon roof that my kids adored. My 2 year old especially loved looking at airplanes in the sky while I was driving. It was a useful built in tool to keep him occupied. This would be great in the Summer at night to turn on the heated seats, lay the front seats down, and star gaze out of the moon roof! It has the best heated seats I have ever seen. They don’t only heat on the seat, but also the lower back area which made the ride home from work that much better! I didn’t get a chance to use it because I’m not a big blue tooth guru, but it does come with a FUSE hands-free link system built into the 7″ HD touch screen. Also, within the same screen, you can touch a button to turn on the map or to turn on GPS. The navigation system includes 3D Mapping and free map upgrades yearly. A funny story about the touch screen/audio, I was a bit confused at first that there wasn’t a slot or section to put a CD. I figured maybe I’m getting old and since it is 2015, people don’t use CD’s anymore… Well, I found a little button and had to push it. To my satisfaction, the screen flipped open, and there it was, the CD slot! They sure thought of it all! There were slots there for updating MAPs and another that looked like a memory card slot – I am not too sure what it is for though. Something cool I definitely noticed while driving home late at night from work on the highway was the auto-dimming rear view mirror.At first I actually thought I was just seeing things when I noticed bright lights behind me turning this darker greenish hue. For me, this was amazing. I would’ve never even thought something like this existed. I have contacts and my vision at night is very poor. I get halo’s around headlights that shine brightly through the mirror, and this completely fixed that issue for me. I felt very safe driving at night. The amazingly bright LED headlights helped with that too!!! The keyless entry feature has officially spoiled me. I know it’s 2015, and I am sure a lot of cars are going this route, but wow. It made my shopping trips with my 2 year old much easier. I was able to leave my keys in my purse, and as long as the keys were near the car, I could unlock the car with a button on the door. I’d have to imagine… I say imagine because I only had 1 key for testing purposes and didn’t want to test my luck.. but I’d have to imagine that this would make it nearly impossible to lock your keys in your car. I would think that since they’re in the car, the outside button would allow you to press to unlock. If anyone can confirm this for keyless entry -please comment below! Either way, it’s still awesome and a luxury you would never know you’re missing out on until you try it for a week! The same for starting and stopping the ignition, completely keyless! It drove fantastic in the snow in the 4WD option and I am sure the all season tires had much to do with that. The fact that there is an option that is as simple as the push of a button to change from 4WD lock, to 2WD, to 4WD auto is great. On a nice summer day with no need to have 4WD, you can save even more on gas mileage by switching to 2WD but just pushing a button! How about that March snow, huh?! The only thing I can say I’d improve overall on this vehicle is the trunk space. 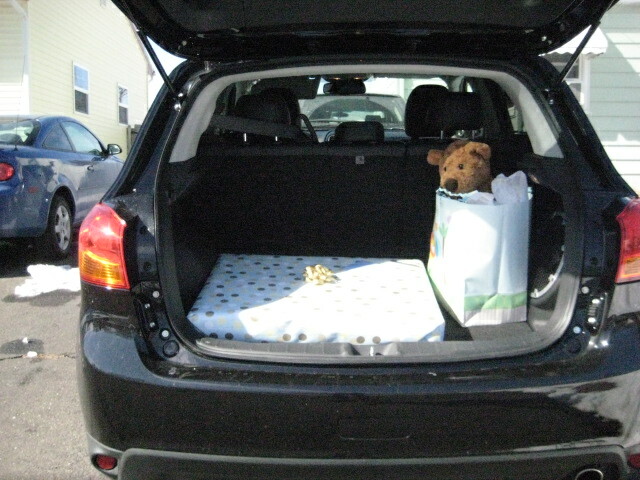 I know it is a SUV Sport model, so it is smaller and more compact, but all the luxuries of an SUV, but with having car seats always in the vehicle, the fold down trunk space would hardly be used, leaving only a small trunk. It made it hard to fit my stroller with my weekly groceries in the trunk alone.